With 18 domestic and international teams already selected to compete in the inaugural running of the American Eagle Outfitters Tour of Pennsylvania Presented By Highmark Healthy High 5®, race organizers today released the details of the demanding 450-mile, six-day race route. A complete field of 20 to 22 teams will compete June 24 through June 29 in this first-of-its kind U-25 cycling stage race that will showcase the sport's next generation of superstars. The cyclists will battle for the leader's jersey along a historically rich route. Beginning on hallowed cycling ground in Philadelphia, the route passes through towns and countryside that roughly follow Forbes Road (U.S. 30), which was forged in 1758 by British General John Forbes and Colonel George Washington. The race culminates in Pittsburgh as part of the city's 250th anniversary celebration. Seven Pennsylvania towns and cities will host the official race starts and finishes, with communities along the way gaining a first-hand look at the world's best young talent in the kind of competition that is normally found only in Europe. In addition to Philadelphia and Pittsburgh, the host cities include Downingtown, Carlisle, Camp Hill, Bedford, Latrobe and Ligonier. "The Tour of Pennsylvania offers $150,000 in total prize money, the richest in the world for Espoir class riders, plus it is the only UCI sanctioned race in the U.S. specifically for riders under age 25," said David Chauner, Pro Cycling Tour president and executive director of the race that is being organized as part of a statewide celebration of Pittsburgh's 250th anniversary. "That combination has stimulated worldwide interest and applications from many more squads than could be accepted for the race. Our technical team has designed a route that will test the endurance, power and technical skill of these young athletes who are on the road to becoming cycling's next Olympians and Tour de France competitors." 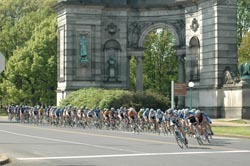 (Start time: 10 a.m. for time trials; 6 p.m. for criterium) With start and finish lines in front of majestic Memorial Hall in Fairmount Park for both the time trial and criterium circuits, Stage 1 places competitors on the same ground as historic events like the 1947 National Cycling Championships, the famous Keystone Open and the Pennsylvania State Track Championships. The two-mile time trial circuit incorporates the Memorial Hall concourse as well as Philly's scenic Martin Luther King Drive. The 1.2 mile criterium, which will total 25 miles, will also play out on the Memorial Hall concourse. Day One will conclude with an auto transfer to Downingtown. (Start time: 10 a.m.) Day 3 starts in Camp Hill at presenting sponsor Highmark's campus there. This stage features a 104-mile road race with a classic European Road race progression. Riders will roll into the race easily for about 37 miles, with sprints in Carlisle and Chambersburg, before ascending the first of two mountain passes. The first KOM begins at mile 66 and climbs 3.5 miles to the top of Tuscarora Summit, a climb that is only the beginning of some very difficult passes to come. The final KOM is at mile 82 at Sideling Hill - this climb is about 3 miles long with an elevation gain of 2,500 feet. After the KOM, the riders will descend at speeds of 50 mph, negotiating some very technical turns, plummeting down to the finish line in the town of Bedford. (Start time: 12 noon) This 60-mile stage will push the riders to their limits with the most elevation gain and the hardest of all climbs in the event. After departing the town of Bedford, the roll will be easy for only 15 miles before turning upward for a difficult climb to Bald Knob Summit, the first KOM for the day. Bald Knob Summit is a 5.5 mile climb with grades of 10% to15 % and will surely decide the day's top climbers, as they make their way up and over the Allegheny Mountains. After a slight rolling descent, the riders will again go up hill and crest the Laurel Hill Summit at mile 40 for the second KOM of the day. This 2 mile climb is shorter but with a very intense mountain pass that will also see grades of 15%. The descent into the last leg of the day will be fast, but will also have a flat section, rolling through Ligonier and following the river into Latrobe with a tricky sprint finish in the downtown area. This day is likely to be the hardest stage and will certainly separate the field, revealing who the potential leaders will be for the week. (Auto transfer from Latrobe to Ligonier. Start time: 12 noon) This 83-mile stage will give the riders a more subdued ride as they enter into the City of Pittsburgh. The route will follow a mostly rolling course with one short KOM at mile 21 and one last intermediate sprint at mile 38 on the outskirts of Latrobe. The race will continue through Pittsburgh's East End and into the City's historic South Side with a sprint finish at the headquarters of title sponsor American Eagle Outfitters. Spectators should be prepared for a thrilling, four-corner city neighborhood sprint finish. (Start time: 5 p.m.) The culmination of the Tour of Pennsylvania will be a 50 mile, classic criterium in the heart of downtown Pittsburgh. A four-corner style course with a slight rise in part of the route, the criterium will offer dynamite spectating for the final day of this history-making, six-day journey now known as the Tour of Pennsylvania. The world's richest cycling race for elite international cyclists under age 25. The six day, 450 mile stage race takes place June 24 to 29 from Philadelphia to Pittsburgh, featuring 20 teams of six riders each (ages 18 to 24) from around the world. The tour is sanctioned by the International Cycling Union (UCI) and will feature future stars of the Olympics and Tour de France. The race offers a cash prize list of $150,000 and will be televised on the Versus cable network, broadcaster of major cycling events including the Tour de France. The Tour of Pennsylvania is being organized by Pittsburgh 250, sponsored by American Eagle Outfitters, the leading lifestyle apparel brand among 15-to-25 year-olds and presented by Highmark Healthy High 5 a five-year, $100 million children's health promotion initiative of the Highmark Foundation. The initiative's goal is to improve the health of children and adolescents ages 6-18 by providing them with the tools and practices needed to live healthier lives by making informed choices. Highmark Healthy High 5 Finish Line Festivals (which are free and open to the community) will feature health and wellness expos, entertainment, games and prizes at each stage finish. The official AE Tour of Pennsylvania merchandise is being produced by American Eagle Outfitters. The Tour of Pennsylvania is managed by Tour of PA, LLC, a partnership between ISM-USA of Pittsburgh and Pro Cycling Tour, LLC of Audubon, PA. For more information, visit www.tourofpa.com.